Do Some Spring Cleaning of Your Assets | Wilson Auction & Realty Co, Ltd.
Are you ready to do your spring cleaning? The season is quickly approaching where we find creative ways to free the clutter in our lives. Some people use this time to clean the playroom to get rid of the toys their kids no longer use or by finally cleaning out the garage. It can also be a good time to do some spring cleaning of your assets by selling items you no longer need at auction. You may not have considered it before, but auctioning off your unneeded items is an excellent way to clear your closets or warehouses and make room for new items and inventory. With the help of the team at Wilson Auction & Realty, you can make your next auction straightforward and successful. Whether you’re clearing out old items ahead of a move or preparing an estate sale, or want to get rid of old inventory or equipment at your farm or business, we can help. Fashions and furniture can take up space when you no longer need them, but many collectors and young families can benefit from buying your old items at an auction. For industries and farms, an auction provides a chance to sell machines and equipment that may be outdated or no longer needed, providing an opportune way to get rid of these unwanted items, make room for the new inventory or equipment and raise a bit of capital in the process. That’s right: It is not only space that you gain when selling excess items or inventory, but money as well. When you put your items up for auction with a successful company like Wilson Auction & Realty, you can look forward to making it a profitable spring by selling these items, often getting more for your belongings at auction than you could when selling it outright. When you work with us, you get an experienced auction house in your corner, and we make your success our primary goal. We start off with a free consultation, providing a chance for us to plan a strategy for a profitable auction and identify all the items you want to sell, and then we let you decide how involved you want to be. You can either be involved in all the important decisions or let us take charge of planning, marketing and holding the auction to make it successful. Take advantage of our auction services this spring and let us help you clean out your closets, garages and storage facilities. 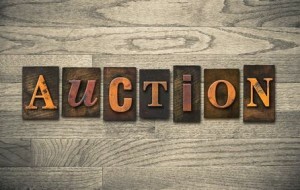 Start planning your auction today by giving Wilson Auction & Realty a call at 419-636-5500.